Coleen Nolan has said her on-screen row with Kim Woodburn was "ugly, upsetting and unpleasant", and she wishes she could turn back time and undo it. More than 7,000 people have complained to Ofcom about Wednesday's Loose Women, which saw the singer clash with the former How Clean Is Your House? host. Some viewers accused Nolan and the ITV show's other panellists of bullying. Nolan said: "Anyone that knows me knows I'm not a bully. That would be the most hurtful thing people could call me." Media regulator Ofcom said it had received 7,015 complaints by 16.00 BST on Friday. The row stems from a public fallout the pair had when they appeared on Celebrity Big Brother last year. The Loose Women appearance was intended as a chance for reconciliation, but ended with Woodburn walking off in tears. In an interview with The Mirror, Nolan said: "I didn't want to do the reunion. It was the producers who said she wanted to make peace. "I agreed because I was happy to draw a line under past differences. "From the moment she arrived, it was clear Kim didn't want to make up. Now I wish I could go back in time and not do it. It was ugly, upsetting and unpleasant for everyone. "Kim even had a go at [fellow Loose Women panellist] Linda Robson, who is one of the nicest women I know. She hates me for a reason I will never understand." Nolan, who is the Mirror's agony aunt, added: "I wish Kim well. I hate to see anyone unhappy. But I want to forget we ever met again. I will never appear on a show with her again. It is better we keep to our own paths." Woodburn's spokesman said she declined to comment. ITV said in a statement on Wednesday: "Kim agreed to come onto the panel today at the invitation of the producers on the understanding it was for a reconciliation with Coleen Nolan. 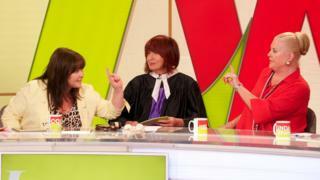 Fellow panellist Janet Street-Porter was dressed as a judge to mediate the pair's conversation, but it soon descended into accusations. Woodburn said she had been bullied by the other housemates on Celebrity Big Brother including Nolan, who she described as "two-faced". Nolan conceded that she had been "two-faced" because she said she had been trying to keep the peace. "I didn't tell you how vile you are from day one. That's what I should have done," she told Woodburn. On Thursday, an Ofcom spokesperson said they had received 3,297 complaints, saying: "We are assessing these complaints against our broadcasting rules, before deciding whether or not to investigate."